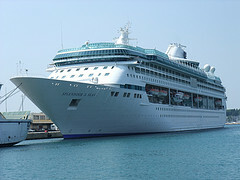 Royal Caribbean's Splendour of the Seas arrived on Wednesday for the first time in Maceió, Alagoas, Brazil to begin cruises in the area. A note from the Secretary of State for Tourism, Danielle Holder Novis, says that the arrival of the Royal Caribbean ship was "an achievement of the State Secretary of Tourism of Alagoas and the Municipal Tourism Promotion of Macedonia, who articulated the process." The 2011/2012 cruise season is the largest that took place in Brazil and according to the Brazilian Association of Maritime Cruises (Abremar), Maceió will receive a visit from nine ships in 37 occasions, totaling over 100,000 cruisers in the capital of Alagoas.